I have been doing my level best to ignore the election for the past several months. Some time ago, I realized, politics in America simply became a branch of the entertainment industry, but for some reason discussing the ins and outs of a campaign—unlike celebrity gossip or the pennant race—still earns one respect as a serious and intelligent person. I once enjoyed being such a person, but for several years, I have been unable to enjoy elections even in the spirit of entertainment. The body count has gotten too high, and it is hard to enjoy the flubs and one-liners when one thinks about the varieties of state-sanctioned murder that are going quietly undiscussed. Of course, without real determination, one cannot entirely escape these people. In Massachusetts, where I live, the most expensive congressional race in the country is taking place. I have been forced to pay some small quantity of attention to it, and this has produced the single political thought that has occurred to me during this election season, which I would like to share. 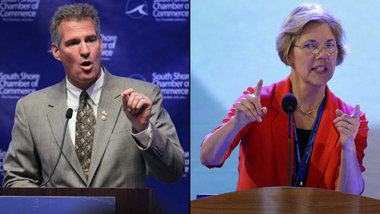 Scott Brown and Elizabeth Warren are running for Senate. Since I grew up rooting for the Orioles, I have watched a few baseball games this year, and have thus been exposed to dozens of ads from both of them. Brown's ads stress his willingness to share in the responsibilities of a household (he cooks occasionally for his daughters) and imply that this shows unusual nobility. Warren ads indicate that she wants to create jobs by investing in infrastructure. While watching this Warren ad, again and again, something occurred to me: each airing of that advertisement is itself a job. If she chose not to air one of these thirty-second spots, she could pay a volunteer a healthy salary for months. Eschew the ads for several innings and she could create a proper job, perhaps several. As a sample of the sums at stake, the Boston Globe reported that, in a six week period in July and August, Brown and Warren raised about six million dollars. (I have heard estimates for the total cost of the presidential race that run close to a billion.) The bulk of this money went to advertising. The first stops for both candidates after raising these funds were two huge Virginia ad agencies: Multi Media Services Corp. for Scott Brown, and Media Strategies & Research for Elizabeth Warren. Think hard about those names and how difficult they are to keep straight. This is simply how all campaigns run—you raise money; you spend it on ads—despite the fact that no one is sure if this advertising has any impact on how people vote. The only widely accepted consequence of advertising is that, if the ads become negative, they depress turnout because of widespread fatigue and disgust (and how). Now, forget about Scott Brown for a second. He is obviously an idiot. He is welcome to spend all of his money asserting that he has a pleasant relationship with his wife and daughters. But Elizabeth Warren, like many progressive candidates, has made the issue of greater income equality central to her campaign. She is sitting on a truly enormous pile of cash, enough to create hundreds of jobs, and she instead chooses to spend the bulk of it on advertisements that promise to create those jobs later. What if, instead of trumpeting her support for struggling homeowners, and pledging to create an agency to provide counselling to help prevent foreclosures, she hired a few people to actually give out such advice? Or—on a simpler level—why not pay the volunteers who make phone calls and wave signs? Make an effort, if you happen to care about them, to hire the poor and unemployed. If Warren—or any candidate—isn't willing to demonstrate her ideals through the structure of an organization over which she has complete control, why should anyone believe that she would work toward these ideals when in power? Are there shades of the old machine system here? Yes, absolutely there are, and that's fine. I prefer the machine to the current system, where all the average voter receives is rhetoric about putting people back to work and stimulating the economy, while campaign funds, which increasingly come from large donors, swirl around in the same elite stratum from where they came—or go from the pocket of some temporarily enthusiastic person to finance a fraction of a second of a television advertisement. At some point, more people in this country are going to notice that the pendulum that swings back and forth between parties every few years is actually being used for hypnosis. It is the swaying of a pocketwatch—change, hope, greatness, change, hope, greatness—while the wars, extra-legal assassinations, despoiling of air, water, and land, growing system of surveillance, and utter lack of accountability for every disaster continue with eerie consistency regardless of the new bodies in the suits. Eventually, though, when things reach a certain pitch (as they will, I suspect, before the decade is out), candidates will emerge from outside the current system: either new parties, or powerful fringe movements within the two major ones. I have faith that this will happen, because the American system of government is well designed, and capable of rejuvenation or at least slower decay. One way to know when a genuinely different candidate has arrived—and this is my single thought for the election season—is that the money they receive will be spent to a large extent on the ground level in their community. Even an unsuccessful campaign, then, will be of some benefit to the district's constituents. My guess is that people are already so immune to political advertising that spending money in this way might actually be a better way to win. And if voters feel that the campaign is spending money in dishonest or unwise ways, it is significantly easier to evaluate such tangible actions than sussing out a candidate's character from ghostwritten speeches and carefully crafted advertisements. If a campaign is filled with inspiring talk about supporting the middle class or (more exceptionally) the poor, simply take a look at how the candidate spends her money: does the lion's share go to a few consultants and media companies, with a smattering for caterers, buses, hotels, another smattering for a few core employees, and virtually nothing for the people who do most of the work? If so, expect the perpetuation of policies that encourage just such a distribution of income when the politician is in power. If a person's own organization cannot be a model of the kind of society they say they want to create, they are not worth wasting a second of attention or enthusiasm on. What they are doing—consciously or unconsciously (it is usually the latter)—is providing a little momentum to help the pocketwatch swing across the eyes again. I look up sometimes and search for the hand that is holding the chain. For all my paranoia, I can never make it out, and I don't trust people who claim to have seen it. But, as it swings by again, I am quite sure that the clock is ticking.